later: The Insight Institute School of Personal Analysis and Development, Worcester Park, Surrey, England. 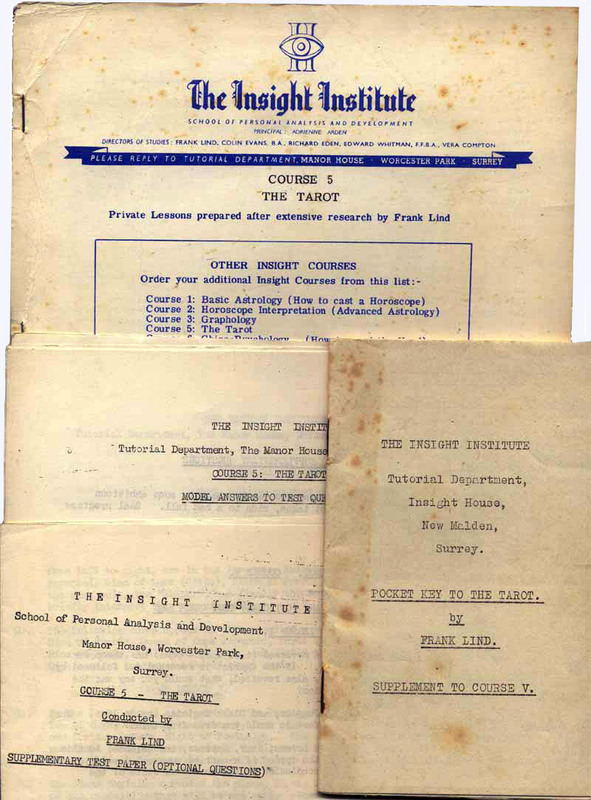 During the late 1940s and 50s the Insight Institute ran a series of correspondence courses on psychic development subjects including the Tarot. 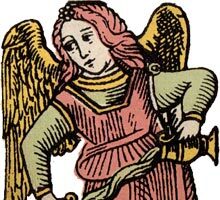 The Institute also published a set of ‘Authenticated’ tarot cards which supposedly restored the ‘correct’ symbolic imagery. The correspondence course lessons, prepared after extensive research by Frank Lind, describes the origins of the tarot as ‘Indian’, introduced by gypsies who spoke Romany. This theory would have been current in the 1940s, although the Italian origin of tarot, or tarocchi, was already known. The Institute was later renamed The Insight Institute School of Personal Analysis and Development. The principal of the Institute was Adrienne Arden, and the “Directors of Studies” were Richard Eden, Noel Jaquin, Colin Evans, Edward Whitman, Vera Crompton and Frank Lind, who subsequently published the correspondence course material under his own name as “How to Understand the Tarot”. The tarot cards which originally accompanied the Insight Institute correspondence course are produced by silk screen printing in plain shades of pink and yellow, with green in the trump cards. 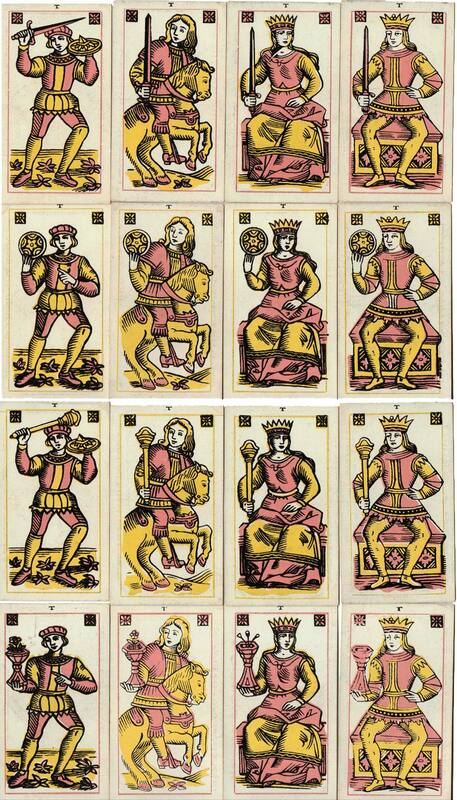 Above: Insight Institute Tarot Court Cards, first published in c.1948, based on fifteenth century Italian ‘Minchiate’ designs, coloured to look like folk art. The cards have square corners, whilst later editions have rounded corners. Each card has a ‘t’ or tau printed at the top. The silk-screen printing process has left the ink raised on the cards: the print is often misaligned, but raised on the card and bleeding over in places. All images courtesy Alison Dunne. Above: Insight Institute Tarot Trumps, first published in c.1948. 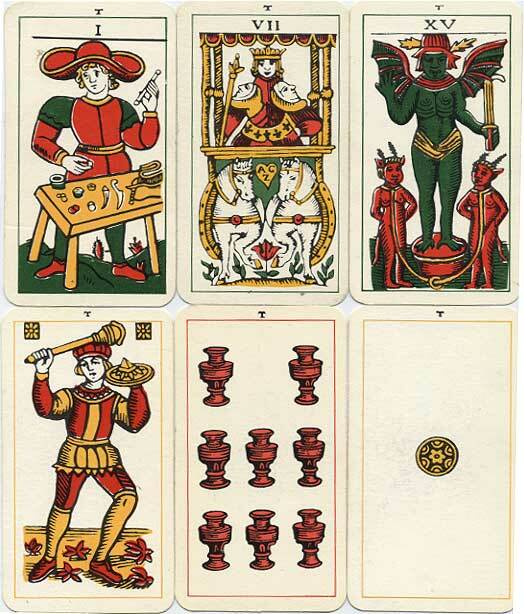 The trumps are numbered with Roman figures and unnamed, and based largely on Tarot de Marseille designs, but with four cards apparently based on the Rider-Waite tarot of 1910. The back design shows an all-seeing eye in front of two capital Is, suggestive of psychic development or initiation. This appears to be the basis on which the pack was ‘Authenticated’. The artisanal silk-screen printing process has left the ink raised on the cards. All images courtesy Alison Dunne. Frank Lind probably carried out his “extensive research” at the British Museum in London, where he would have been able to view several antique specimens of Italian tarocchi packs, minchiate packs and playing cards, from which the Insight Institute court cards are derived, as well as Tarot de Marseille decks which are the inspiration for most of the trump cards in the Insight Institute pack. 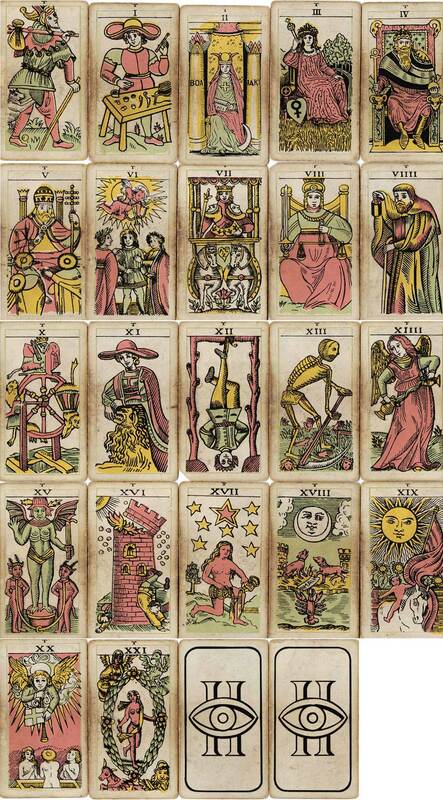 The remaining minor arcana, or numeral cards, are also based on early Italian designs. The meaning of the inscriptions of some trump cards is obscure. It is on this basis that the pack was ‘Authenticated’. He would also have consulted the current literature on the subject, which would have included several theories concerning the origins of the tarot as well as theories concerning the occult significance of the trump cards. 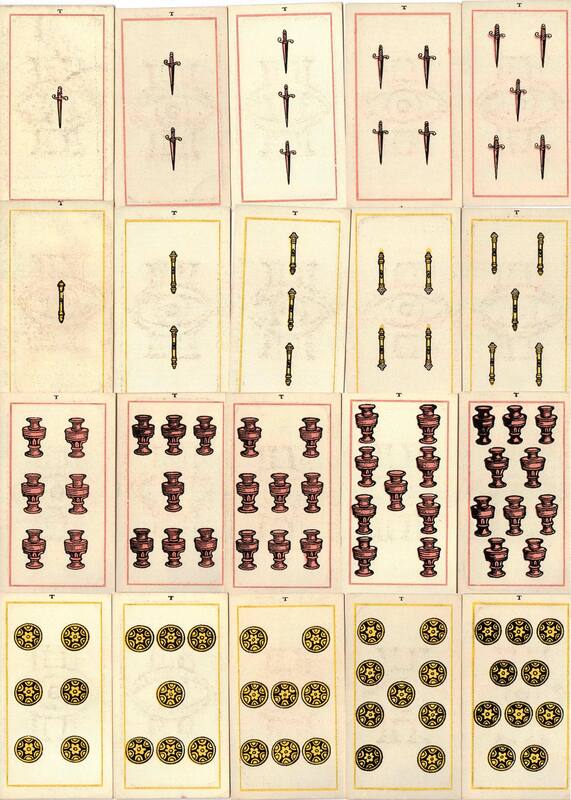 It also needs to be borne in mind that early books on playing card history tended to copy from each other and replicate the same errors and myths. The cards and book were later re-published during the 1970s and also associated with Richard Gardner who continued to claim that the cards were ‘Authentic English tarot cards’. Later editions of the cards have brighter shades of colour, and rounded corners. • Article by Frank Lind on the Tarot, Prediction magazine, UK, March 1949. • Insight Institute Tarot on Tarot Collector's Forum website.